Cleopatras Needle lamp or antique Bronze Cigar Lighter? My late grandfather brought this lamp back, whilst in the merchant navy at least 65 years ago. It’s in the shape of Cleopatra’s needle. I believe he may have purchased it from a bric-a-brac shop in Liverpool. I have since found out that this lamp would appear to have started its life as a bronze cigar lighter which was made to commemorate the bringing of Cleopatra’s needle to London in 1878. I also believe this would have been originally a shop fitting or part of a display and there would have been a gas flame coming from a valve on the top of the obelisk. Unfortunately this valve was never with the piece as it had been adapted to use as a light and a light fitting added. The light fitting being very old was removed some years ago as it was unsafe. I am curious to know whether there were many of these bronze cigar lighters made. I have only seen one other for sale at over £1,200 but this was a complete piece. Mine has great sentimental value as my grandfather following his time in the merchant navy came to work in the mines in the North East and was killed shortly after his 28th birthday. We have always been curious about the bronze cigar lighter and would be delighted if anyone could give us further information. 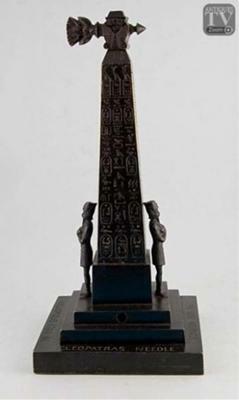 The picture I have added is the complete item, mine is missing the valve at the top of the obelisk.